Likely to conclude positive without strong evidence to overturn a positive prediction. Derek Nexus – Positive (plausible) prediction based on alert 842: Triazoline. Sarah Nexus – Negative with a Moderate (20%) confidence. "The mutagenic activity of triazolines is likely to be promoted by the formation of an electrophilic species. 1-Alkyltriazolines decompose readily in aqueous solution forming electrophilic 1-alkylaziridines from reactive aminoethyldiazonium ion intermediates. Similarly, 1-alkyltriazolines have also been shown to decompose to 1-alkylaziridines [Heine and Tomalia]." 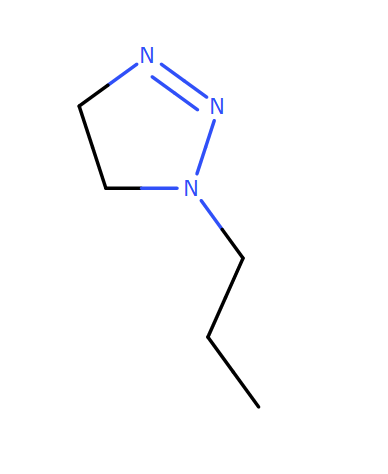 The examples in the Derek alert are similar to N-propyl triazoline and hence relevant. A plausible mechanism for the mutagenic activity of alkyltriazolines is described in the comments section. Sarah has only a single hypothesis and the supporting examples are structurally dissimilar to the query compound. Positive – Derek Nexus fires an alert which is supported by structurally similar examples. The training examples provided by Sarah Nexus are not relevant to the query compound and without further data to overturn it, the positive call from Derek Nexus should be upheld.